To support and enhance students' educational experience by helping them value the relationship between what they learn in the classroom and what they will need as future leaders and members of tomorrow's work force. 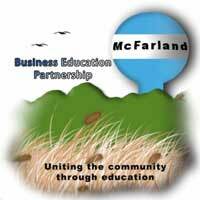 To provide strong education, business, and community partnerships to ensure access by all students to workplace experiences and to give students academic and occupational skills. The BEP members represent students, teachers, administration, school board, parents, and community members. To learn more about how you can help the BEP, contact Cindy Brady at 838-4500 x 4709.